Some memories don’t go away. Of all the Christmas recollections I have, one of the most powerful is also the most disturbing. We were invited to a neighbourhood family’s Christmas party. There, in the middle of the room, tickling the high ceiling, stood a statuesque tree. The lights twinkled in time to carols playing softly in the background. Officially, I was a little too old to be awestruck, but fascinated I certainly was. For years, the controversy around bringing home hacked Christmas trees has been brewing. According to Wikipedia, America alone gobbles up 33-36 million Christmas trees every year. According to another source, about a hundred years ago almost all Christmas trees were brought in from forests. Things have changed since and most are from tree farms. Farmers argue that they replenish one cut tree with two or even three more. Some say they cut the tree to a stub so that a new branch pushes through. So technically, the tree is not being cut but pruned. Once you decide on what not to do, it’s not too tough to decide on what to bring home. Do you want to set up an artificial Christmas tree? On the minus side, you encourage the trade of non-biodegradable trees. On the plus side, they can last a lifetime if they are kept away with care once you’re done with the season. Or, get a true tree that grows with the kids. There are several Christmas trees to choose from. Fir and pine trees are a good choice. You could also pick up a juniper, casuarina or cypress. 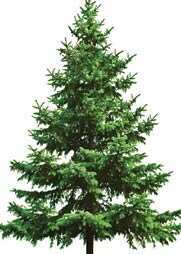 If you’re bringing home a pine, remember, the needles it sheds can take a little maintenance. Or, if you love plants, any plant you truly care for will do. Says plant enthusiast Anita Roy: “We bring in a different plant from our garden each year and decorate it. You can relate to plants that you have personally cared for and that have been with you for years." One year, 11 winters back, it was the turn of the cactus. They were told that the plant would bring bad luck. “But we loved it as much as we did the other plants. I had grown this cactus from a cutting a few inches long. After about seven years, it stood a few feet high." Try and shed plastic. Try to ensure the decorations you string on the tree are from natural material. Pine cones, ribbon ornaments and stuffed cotton stars, for example, can look as snazzy as the artificial decorations. Keep the tree lights minimal since you wouldn’t want the leaves or needles to get singed.